is Physical Therapist Assistant at Vargo PT’s Burbank location specializing in orthopedics. His passion for physical therapy stems from his love for sports and helping others. Having an older sister and father in the medical field, Andrew was influenced early on to follow a similar path. 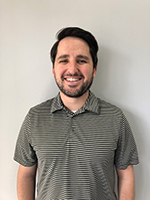 After obtaining his Bachelor’s degree in Kinesiology from California State University, Northridge in 2014, Andrew worked for Vargo PT as a physical therapy aide for 2 years. He then went on to complete his Physical Therapist Assistant degree at Concorde Career College in 2018. Andrew enjoys connecting with patients and being a part of their recovery back to living a pain free life. On the weekends Andy enjoys staying active by running & hiking. He also appreciates spending time with friends and family.